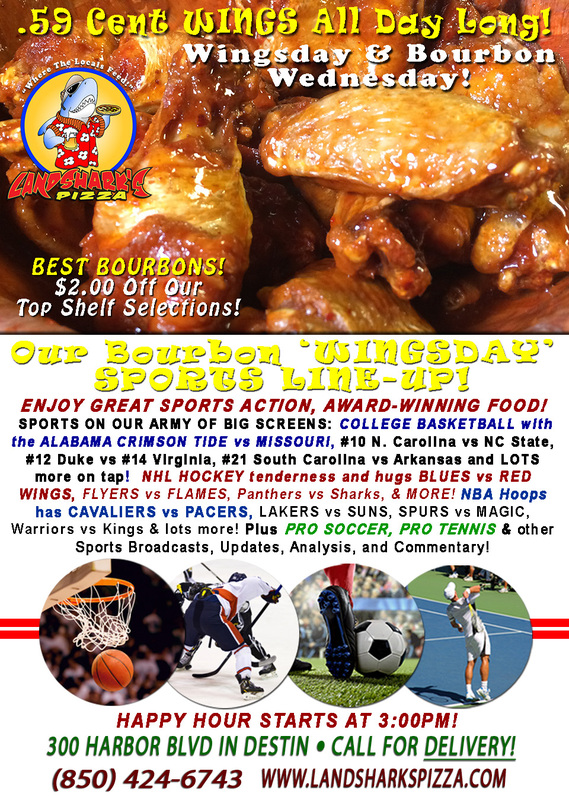 / Barbecue / Delicious Destin BBQ SPECIAL at Landshark’s & SPORTS – PGA GENESIS OPEN, College & NBA Hoops, Plus NHL & Tennis! JUICY, SLOW-SMOKED, FALL-OFF-THE-BONE PULLED PORK BBQ with Succulent Seasoned Fries – Just $6.99 (dine-in with drink purchase)! 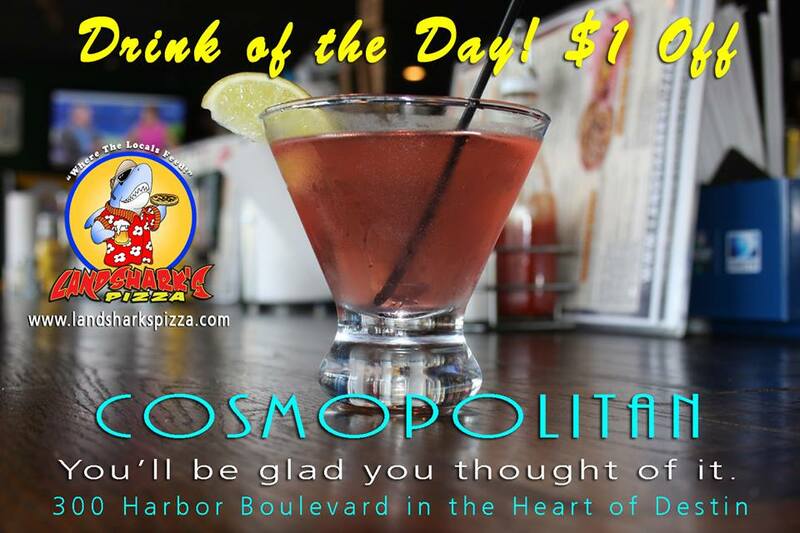 LANDSHARK’S DRINK OF THE DAY: $1 OFF our tasty & uplifting ‘COSMOPOLITAN’ cocktail! 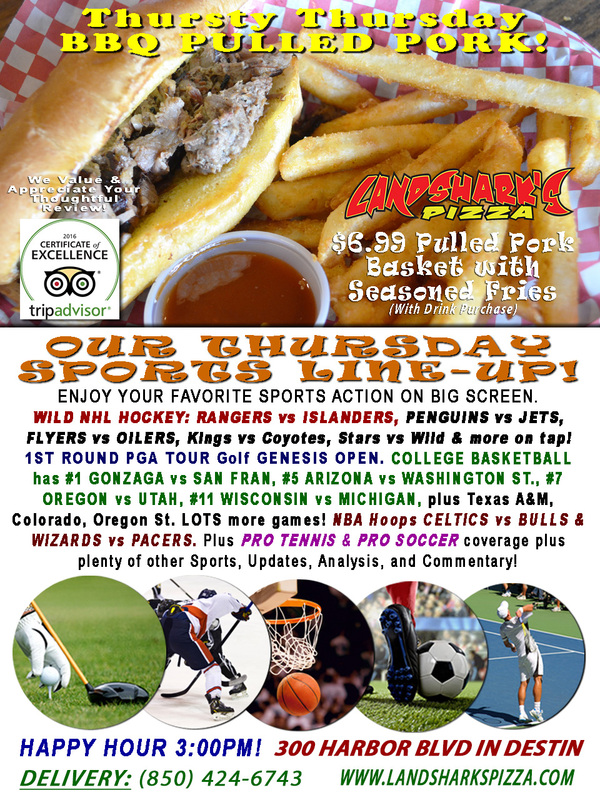 SPORTS ON OUR ARMY OF BIG SCREENS – NHL HOCKEY action with RANGERS vs ISLANDERS, PENGUINS vs JETS, FLYERS vs OILERS, Kings vs Coyotes, Stars vs Wild & more on tap! COLLEGE BASKETBALL has #1 GONZAGA vs SAN FRAN, #5 ARIZONA vs WASHINGTON ST., #7 OREGON vs UTAH, #11 WISCONSIN vs MICHIGAN, plus Texas A&M, Colorado, Oregon St. LOTS more games! 1ST ROUND PGA TOUR Golf from the GENESIS OPEN. NBA Hoops CELTICS vs BULLS & WIZARDS vs PACERS. 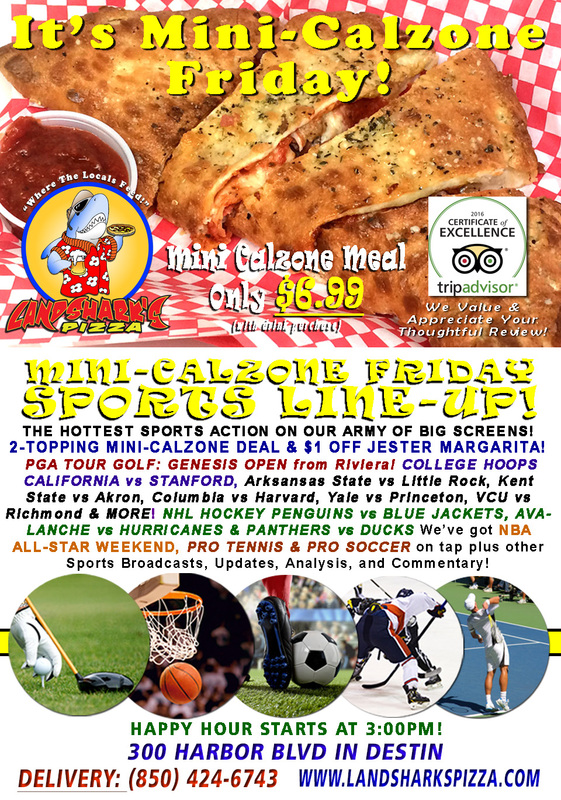 Also PRO TENNIS & SOCCER coverage plus plenty of other Sports Broadcasts, Sporting News, Analysis, and Commentary! Previous Post: « Make HUMPDAY a HAPPY DAY with Award-Winning HOT WINGS Just .59¢ Ea. and get $2 Off TOP SHELF Bourbons!